Sometimes we fall into the cyclical trap of thinking our contribution is so teeny-tiny in the grand scheme of things that we don’t bother. But what if everyone thought that way? Nobody would be helping, and the world would be suffering much more than it is already. A stinky thought, right? So, now I ask you, do any of these sound familiar? So, let me answer that question for you. Yes, you have. We are all guilty of these phrases! Those tend to be common excuses among people who don’t want to be bothered with contributing now. Ironically, those people tend to be bothered most by others who are not doing their part, when they aren’t doing anything either. Do you pause briefly and ask, “why isn’t anyone doing anything?” And quickly forget and move on with life. In our day and age when everyone is connected 24/7, we forget to connect to the live human beings right in our presence. We get caught up in our newsfeeds and care more about hearing what Matt Bellassai is going to say on “This Episode on Wine About It”. Don’t get me wrong, he leaves me in stitches from laughing, but we get distracted by those everyday entertainment updates, and are totally blind to people in the world who are in need of our help, or a little extra boost. It could be a next-door neighbor, co-worker, a friend, or a stranger all the way across the world. However, we are too busy scrolling to notice; we are too caught up in our own little worlds to make a difference in someone else’s. Is it that simple? YEAH ACTUALLY! Instead of being overwhelmed and thinking your part is too small to make a difference, make the decision to do what you can, with what you have, where you are right now. This #GivingTuesday we are working closely with Hope Home in Chaing Mai, Thailand. So we can make a difference starting, well, NOW; I told you it was exciting! Oh, wait, huh? Who or what is Hope Home? Well dang! I’m happy you asked! Hope Home is a foster care home for disabled children nestled in Northern Thailand that makes a point to take in children and families that need help with the everyday struggles of special needs. They lend a hand to children with autism. Children with down syndrome. Children with cerebral palsy, and a variety of other physical and mental disabilities. This holiday season we are assisting in creating a sensory room to further help the growth, success, and happiness of each and every child there. I am not here to say “Alright lets go, empty those pockets of yours! Show me whatcha got!”, while holding out an empty pillowcase to throw all your cash into. No! One, I don’t have a ski mask or pillowcase readily available. Two, that’s no way to “ask” for help, GOSH. Three, this is a blog post, so lets be honest here, that’s not even possible. I am here to remind you of how the smallest impact can have a domino effect. Think about how much power you hold this #GivingTuesday, this holiday season, and how much change you are capable of in this world. There are real ways that you can help children in Chaing Mai. Would you like to know? Ok, good, here’s how! By joining #GivingTuesday, you bring happiness into your own life as well as the lives you are helping. Excuses are executed. Inaction is transformed into an international life of purpose and action. You are no longer watching; you are doing. DONATE – Even the smallest donation can change the course of someone’s life for the better. GIVE – Spreading the simple act of giving is spreading love; there are so many ways to do so. With a purpose outside of ourselves and the little world we only see through our cell phones these days, we stop just watching. We stop blaming others. We become catalysts for real change. By doing, we start loving. By giving, we start living. You are that “somebody” who can do something with what you have, right where you are. 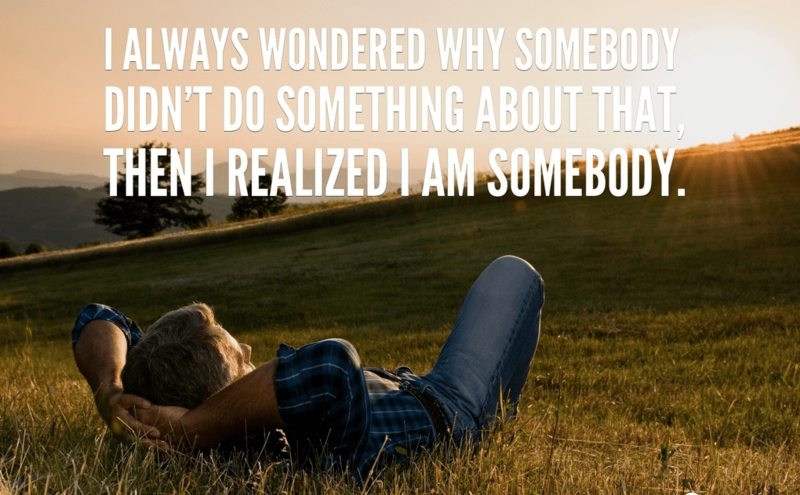 I am “somebody” who can do something. Join us and help in making the “Land of Smiles” a land of opportunities for the children and families at Hope Home! This blog was written by Shelby Lisieski, Content Marketing intern for the GoAbroad Foundation, with contributions from Stacey Sloughfy.